STEVEN M. BRAGG, CPA, has been the chief financial officer or controller of four companies, as well as a consulting manager at Ernst & Young and an auditor at Deloitte & Touche. He received a master's degree in finance from Bentley College, an MBA from Babson College, and a bachelor's degree in economics from the University of Maine. He has been the two-time president of the Colorado Mountain Club, is an avid alpine skier and mountain biker, and is a certified master diver. Mr. Bragg resides in Centennial, Colorado. He is also the author of Accounting Best Practices and Accounting Policies and Procedures Manual (both published by Wiley). 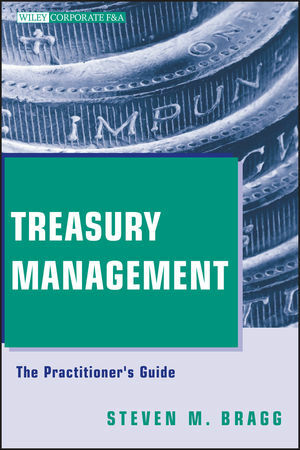 Role of the Treasury Department. Position of Treasury within the Corporate Structure. Chapter 2 Cash Transfer Methods. Summary of Cash Transfer Methods. Information Sources for the Cash Forecast. Comparison of Account Sweeping and Notional Pooling. Chapter 5 Working Capital Management. Chapter 9 Foreign Exchange Risk Management. The Nature of Foreign Exchange Risk. Data Collection for Foreign Exchange Risk Management. Record Keeping for Foreign Exchange Hedging Activities. Chapter 10 Interest Risk Management. Accounting for Interest Risk Management Activities. Record Keeping for Interest Rate Risk Management. Chapter 11 Clearing and Settlement Systems. Characteristics of Clearing and Settlement Systems. Overview of the Clearing and Settlement Process. Automated Clearing House (ACH) System. Clearing House Interbank Payments System (CHIPS). The Continuous Link Settlement (CLS) System.